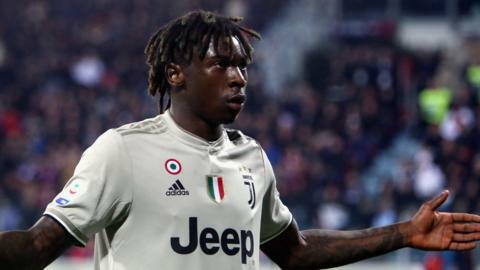 The racist abuse of Juventus forward Moise Kean was "intolerable" and such incidents "can't go on", says Italy boss Roberto Mancini. Italy make it two wins out of the two at the start of the Euro 2020 qualifying campaign to top Group J as they hammer Liechtenstein in Parma. Teenager Moise Kean scores his first international goal as Italy begin their Euro 2020 qualifying campaign with a comfortable win over Finland. Inter Milan decide not to appeal against the two-match stadium closure imposed after trouble at their recent game against Napoli at the San Siro. Is Perrotta England's most recent World Cup winner? If Simone Perrotta won the 2006 World Cup for Italy but was born in England, does that mean he is England's latest World Cup hero? Chris Stark speaks to him and finds out. Read more on Is Perrotta England's most recent World Cup winner? What can Chelsea expect from Conte? A big personality, a rich pedigree, iron discipline and mind games - Phil McNulty examines Chelsea's new manager Antonio Conte. Read more on What can Chelsea expect from Conte? Gordon Strachan will hope facing Italy provides a test that can be a springboard for Scotland success, writes Liam McLeod. Who is playing? How can you watch the games? Who does our expert think will win? All the information you need on World Cup day three. Italy legend Salvatore 'Toto' Schillaci recalls riots, wild eyes and magic nights of the 1990 World Cup. Italy have not won in seven games but England will dismiss their threat at its peril, warns James Horncastle.